A Day Without A Woman: What is Labor? Today is A Day Without a Woman. I'm "on strike" today, although I can't fully release myself from child care. Partly because I'm a nursing mom and partly because someone's gotta do it and it might as well be me. Shawn is leaning into housework and child care otherwise though. 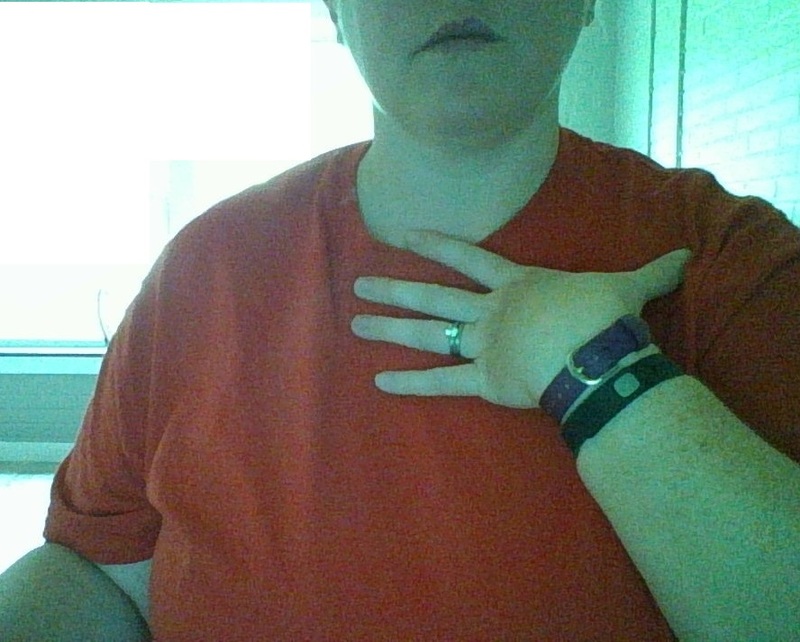 And we're all wearing red! And not spending any money today. It's made me think about what labor is, since some things I do for myself, just general self care. I'd make a meal for myself if I didn't have the family to labor for. (To get around it I made a casserole yesterday that we can just heat and eat.) I'd also make my bed, so I made my half and Shawn made his half - LOL! Does blogging count as labor? You could say I'm a small, woman-owned business, which is one of the exceptions for where strikers can shop. Even if it does count as labor, I'm still writing because I want to mark this day. When talking about it with Jane (and fighting with her about wearing red instead of her favorite Avenger's shirt), I explained that boys and girls are equal, and we deserve equal pay for equal work. She quickly asked about Donald Trump, and I explained that this particular issue existed before him and will after him too. This is kind of a mishmash blanket. I did the ripple/chevron pattern from a baby pattern book, and I didn't like the number so set it at seven on the up, seven on the down. This has ridges created by front-post and back-post double crochets. I did the pattern of which rows have which stitches based on this Red Heart afghan. 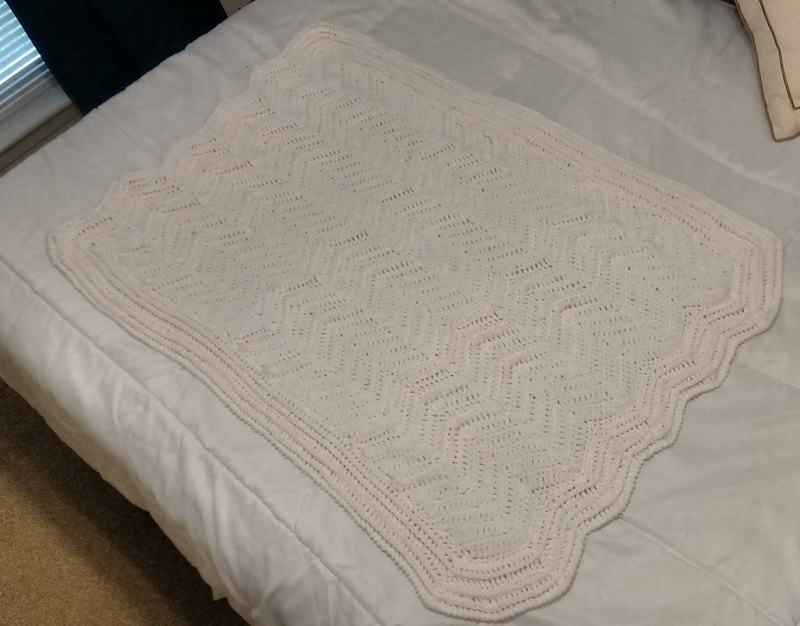 After I finished the sizing was off -- it wasn't wide enough for a real baby blanket. SO I added some border stitches, using the same front/back post stitches to make the ridges. And I finished off with reverse single crochet that makes a similar ridge/rope-like edge. So it's a little wonky but is one of a kind. And it was made with love and prayer for the life of this special boy. I've been watching Roseanne reruns on this over-the-air channel called Laff. I really like the show -- something I watched as a kid and probably didn't "get" most of it. I laugh during every episode and some of the "viewer discretion advised" storylines are relevant still (abortion, racism, abuse, gay marriage). One thing I like too is the daughters -- Darlene and Becky -- and how they're not wearing skimpy clothes or lots of make up. They look like regular people, and at least at the start of the series before plastic surgery so does Roseanne. Part of the clothing choices was due to the 90s I guess, when flannel and jeans were in, but I'm sure it was also a conscious decision on the part of the creators. One guest star was the opposite of "regular" when Traci Lords played a waitress for a few episodes. In one she wore a tight blue dress and looked so thin relative to the other characters that I took notice. It made me start thinking about what it would be like be so small and to take up so little space. Unapologetic fat women embrace the philosophy of displacement. They manifest the audacity of space-taking. They cleave the very air. This is not just fatness of the body, it is fatness of the mind. If you have a fat body, you take up room by default. If you have a fat mind, you choose to take up room. In high school I was a perfectly fine size, and as an athlete I was the healthiest I could ever hope to be. But I was still bigger than a lot of the girls. One was size 5 -- not sure how that came up, but you know everyone knows everything in locker rooms. I was size 11, and I looked at her and at me and said "even if I lost a ton of weight I doubt my bones would even be that small for me to be a size 5." She said "oh I'm sure you could." She meant it as a kind thing, and in the moment/actual conversation that's how I took it. But obviously remembering it across twenty (20!) years it hasn't settled as something good.